BRANDON – Brandon University has a glossy new face to show to the community. A fully redesigned university magazine is now hitting alumni mailboxes, and is already available at locations around campus. 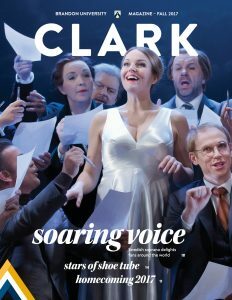 Called Clark, the new magazine boasts a bold new style, and emphasizes expanded features that tell the story of Brandon University through profiles of students, faculty and alumni. The magazine also highlights research achievements, notable news from campus, and the latest from the Bobcats. Clark, Brandon University’s redesigned magazine, boasts a bold, new style and expanded features. Published twice-yearly, in the Spring/Summer and Fall/ Winter, Clark continues the important and looked-for features that were found in Alumni News, including information about Homecoming, Convocation, faculty and student research, award winners, donors, and feature profiles of faculty, staff, students and alumni. Clark takes a fresh approach to these features with a new emphasis on storytelling and longer, more in-depth articles. “There are so many amazing and inspiring stories every day at Brandon University, and featuring them in Alumni News has long been a great way to promote them. We wanted to bring that same amazement and discovery to everyone,” said Grant Hamilton, Director of Marketing and Communications at BU. The name Clark has a long and distinguished history at Brandon University. Clark Hall is the second building constructed on the university’s 18th Street campus, and opened as a women’s residence in October 1906. It was named after Dr. Charles Whitfield Clark, a prominent Winnipeg physician who, with his wife Martha (née Brown), raised a large sum of money to construct the building. Dr. Clark, who served as President of the College of Physicians and Surgeons of Manitoba, said at the opening of the building that the couple’s contributions were to assist the women of the west. Today, BU retains their drive to support students and to provide the benefits of a quality post-secondary education to as many people as possible. Clark Hall, which has been connected to the original Brandon College building, is one of the most distinctive buildings in Brandon, and remains an iconic architectural symbol of Brandon University. Clark honours the memories of Dr. and Mrs. Clark, their contributions to education in Brandon, and BU’s ongoing commitment to post-secondary education for all. As a publication, Clark’s emphasis is on success, on impact beyond that suggested by BU’s size, on collaboration, and on the surprising and innovative partnerships and approaches that are possible in a compact and nimble university. Alumni remain the largest audience, thanks to home delivery of the magazine, and Clark will also open up Brandon University’s stories and successes to reach new and larger groups of people, including members of the community, future students, and research partners. Alumni who would like to ensure they’re on the mailing list for Clark should contact Alumni@BrandonU.ca and confirm their address. Community organizations who can offer a space for Clark in their offices or waiting rooms are encouraged to also send an email and delivery will be arranged. For story ideas and suggestions, the magazine can be email at ClarkMag@BrandonU.ca.